EOS Ventures, a renewable energy development and financial services company, was poised to lose $5 million last summer. The Berkshires-based company had entered solar power purchase agreements (PPAs) with seven organizations throughout its home state of Massachusetts and planned to use state grants to offset a significant portion of the installation and material costs. When Massachusetts changed the way it calculated the grant funding, EOS lost 26 percent of its grant money. The loss of grant money days before closing threatened to derail all seven projects. To preserve the projects, EOS transformed seven projects into a single project. 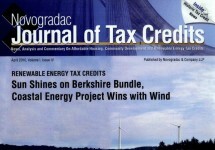 The new project, called the “Berkshire Bundle,” qualified for renewable energy tax credits (RETCs). The RETC equity revived the project and EOS placed the seven solar arrays in service by December 31. “This is really an example of how solar energy projects should be done and why the government should continue to look at this as a wise investment,” said Andres Garzon, Berkshire Bank’s vice president and controller. Berkshire Bank, a RETC investor since early 2009, provided equity for the project. EOS bundled the properties into one transaction and entered into a PPA with each organization. Under the standard PPAs, EOS owns the 811-kilowatt (kW) solar arrays and sells solar energy to the sites. Any power the organizations do not use, EOS sells to local utility companies. Alteris Renewables, a design-build renewable energy company, installed the solar panels at each of the sites, and will maintain and monitor the solar arrays for EOS. The structure eliminates the need for the organizations using the solar power to provide an initial capital investment. The Berkshire Bundle, a $4.5 million transaction, included $1.85 million in state rebates, $1.85 million in RETCs and $800,000 in debt. 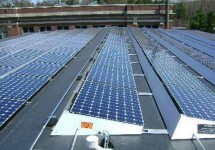 It produced solar arrays at seven Massachusetts sites: Bedard Brothers, a car dealership in Cheshire; Berkshire South Regional Community Center, an aquatic, fitness and educational center in Great Barrington; Hancock Shaker Village, a historic village and farm in Hancock; Quality Printing Company, a graphic, printing and mailing service company in Pittsfield; Town of West Stockbridge, a town of 1,650 in the Southern Berkshires; Brandeis University, a private research university in Waltham; and Wheeler Farm, the Wheeler School’s farm campus in Seekonk. When EOS conceived the individual projects, the company planned to use the Massachusetts Renewable Energy Trust Commonwealth Solar Initiative grants to fund a large portion of the equipment and installation costs. EOS used the reduced grants to offset installation costs for the solar arrays. “They scaled back the formula that determines the grant amount. That reduced our grants by about 26 percent, which was big money … They were trying to slow down the pace of distributions to make the program last longer. Unfortunately by mid-fall they stopped accepting applications completely because of lack of funds,” said EOS’s CEO Tyler Fairbank. The Berkshire Bundle properties submitted their applications before the cutoff, so the state program provided rebates for their commercial solar systems. The grant program required the systems to be operational by year’s end. A loan and RETC investment from Berkshire Bank filled the funding gap. Berkshire Bank, part of Berkshire Hills Bancorp, is an experienced tax credit investor that invested in eight of EOS’s 10 RETC deals last year. The community bank also had relationships with several of the organizations involved in the transaction. Because EOS placed the projects in service by year’s end, Berkshire was also able to benefit from the bonus depreciation provision included in 2008’s Housing and Economic Recovery Act. The provision allowed Berkshire to write off 60 percent its investment as a loss in 2009. For the seven organizations that received the solar arrays, the advantages of the transaction included low upfront costs and reduced energy costs. Quality Printing Company installed the panels on its BerkshireCounty headquarters to reduce greenhouse gas emissions and lower energy consumption. Alteris expects the array to produce nearly 140,000 kW-hours of energy per year. BerkshireSouthRegionalCommunity Center’s 84- kW solar array is one of many green changes that the community center has made in the past few years. Alteris estimates the system will offset 15 percent of the facility load. Bedard Brothers car dealership has a 64.4-kW array that will offset 84 percent of its facility load. HancockShakerVillage’s 89.6-kW system will produce nearly 105,000 kW-hours of energy. West Stockbridge installed the panels on its town hall to offset 43 percent of the facility load. At BrandeisUniversity and the WheelerSchool, the panels are part of comprehensive plans to reduce their carbon footprints. Brandeis’s Climate Action Plan will eliminate 15 percent of the university’s greenhouse gas emissions by 2015 and make the campus climate neutral by 2050. Brandeis expects the Gosman Sports and ConvocationCenter’s 277-kW rooftop solar array to produce 10 percent of the center’s energy each year. The 100-kW solar system at the WheelerSchool’s Van Norman Field House is part of an award-winning green initiative the school began in 2008. The array will provide nearly 100 percent of the field house’s energy. The school uses the array as a teaching tool with students participating in the project planning. “By converting to solar panels and having the farm run completely on solar energy, Wheeler is dramatically decreasing its environmental impact. It’s fantastic to see such a commitment being made by an institution and school,” said student Sol Taubin, co-president of Wheeler’s Environmental Concerns Organization (ECO). ECO members regularly attended planning meetings with EOS, Alteris and school officials. The solar installations are also part of Massachusetts plan to reduce energy consumption. The state plans to support the creation of 400 megawatts of solar photovoltaic though a Solar Carve-Out Program. The new program, which replaced the grant program that funded the Berkshire Bundle, provides solar renewable energy credits to projects. The Berkshire Bundle’s financing structure is compatible with the new program and EOS plans to use the program to fund additional projects. Furthering its commitment to environmental stewardship through sound business practice, Fuss & O’Neill installed a 36 kilowatt system on the roof of its corporate headquarters in Manchester, CT. The 36 kilowatt system will produce roughly 40,000 kilowatts-hours of clean energy annually. The solar array is comprised of one hundred nineteen 305 watt modules. The installation was made possible through a Power Purchase Agreement with EOS Ventures of Massachusetts and a grant from the Connecticut Clean Energy Fund (CCEF). Alteris was chosen for this project over several other large solar integrators because of its Engineering Design, Project Management expertise, and demonstrated performance across its broad base of commercial installations. • Effectively eliminate over 1 million miles of driving.